Why only give your kids a ball when you can give them the whole court? The Sportspower Sportspower Fly Slama Jama Inflatable Basketball Court is just the inflatable toy to gift them to get them active! 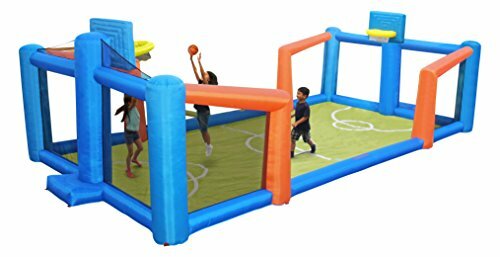 Outdoor Inflatable Basketball Court is a full kit that comes with 450Watt blower, carry bag, 2PC PVC water bag, and ball for easy assembly, travel and storage. Air blower inflates in less than 2 minutes so kids can enjoy outdoor sports action. Constructed of durable polyester with PVC coating for added strength and toughness. Ideal for large backyards; measures 28' x 12' x 7.5'. Makes a great addition to any playground or backyard and can be used year round.